The meeting will be held on 26th March 2015, from 17.00 – 20.00 – ul. Bracka 18/63, Foundation for Somalia, Warsaw. Organizer is James Omolo, president of the Africa Connect Foundation and Intercultural Incubator member. Patrons are Global African Dialogue and Foundation for Somalia. 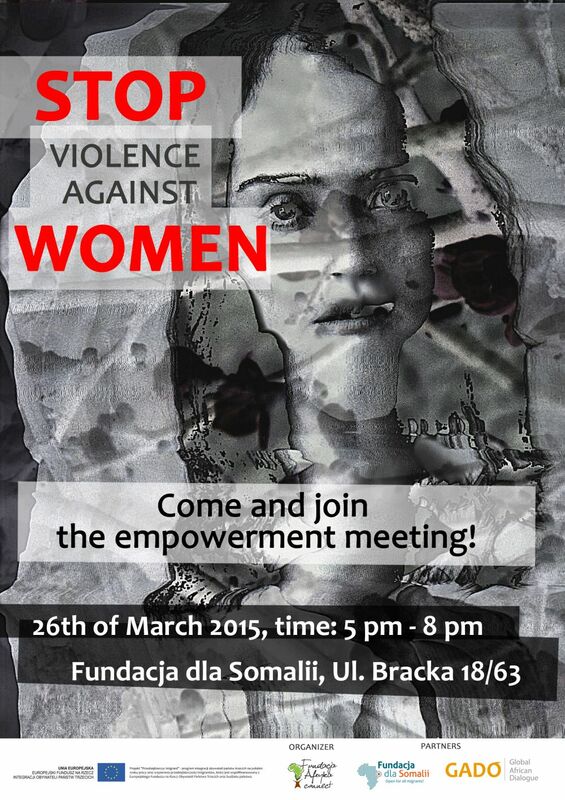 The meeting will be held under the theme STOP Violence against women. We will try to go through some specific cases of domestic violence – in different countries, to show you that it doesn’t matter where we live, the violence has no borders. Also we will show you some documents that will introduce you to this cruel phenomenon in different cultures. What is more, we would like to help you in identifying the existence of domestic violence and also give you some tips where you should look for help if it is needed. Among presentation in the programme you may listen for example to world wide scale of the problem analysis prepared by Omoye Akhagba (Global African Dialogue, IFiS PAN), comparative case studies (Polish and African) prepared by Agnieszka Kosińska and Magdalena Misztal. Anna Karbowniak (Foundation for Somalia) will speak about mobbing and its prevention.